The First Baptist Church in Medicine Lodge, Kansas underwent some beautiful changes recently when we installed new church pews. The pews they selected are upholstered with a gorgeous deep blue olefin fabric and simple church pew ends with decorative crosses. But what’s the most striking is the pews are angled towards the altar and pulpit. By angling the church pews, we gave the church a much more welcoming feel. Combined with the low church pew ends, it gives the church a comfortable and open feel. Medicine Lodge, Kansas, was named after a medicine lodge built by the Kiowa in 1866 for their annual sun god celebration. Medicine Lodge became integral in the signing of the Medicine Lodge Treaty. Today, Medicine Lodge holds a Peace Treaty Pageant every year to commemorate the event that influenced western American history. After attacks from neighboring Native American tribes, Medicine Lodge built a stockade to protect the residents from outside attacks in 1874, well after a hotel, stores, and post office had been established. Medicine Lodge was also home to Carry Nation, an infamous Temperance leader known for brandishing a hatchet in bars and saloons as she campaigned for Prohibition. Visitors to Medicine Lodge, Kansas can see her home and see the stockades on the same grounds. 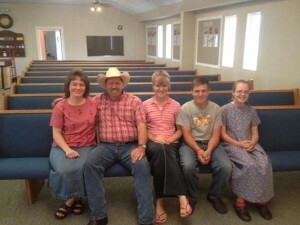 We hope that Pastor Messer and the congregation at First Baptist Church enjoy their new church pews. We always love meeting other Christians and serving the Lord by installing affordable church pews for churches across the nation. 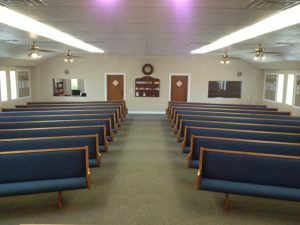 While Medicine Lodge is close to home for us compared to other churches we’ve served, if you’re in need of church pews anywhere in the United States, we’re happy to serve you. Contact us to find out how we can help you update your church seating to something comfortable, affordable, and durable.